#1 choice of riflemen for 25 years! Our #1 selling Scope target continues to get rave reviews from riflemen who are serious about pinpoint accuracy. 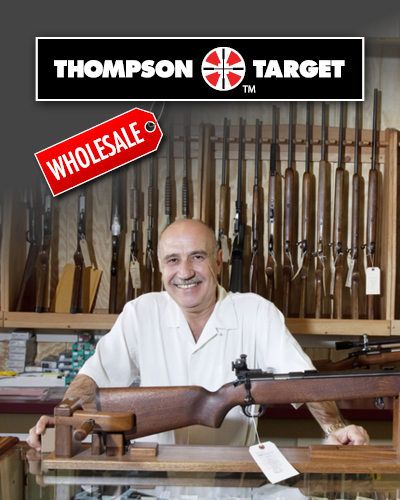 Thompson's SCOPE targets with unique angular design enable you to register the crosshairs within the target and accurately lock-in on the center point. Most other targets force you to block the center point with the crosshairs, defeating the purpose. This progressive target has a bright, highly visible center point for precise registration whether you're using 2-power or 20-power at 50 yards or 300 yards down range. Bright fluorescent red and white target includes 1" grid and scoring area. Recommended for rifles and pistols at distances of 50 to 300 yards. Great concept in target design! Just tried out these new targets, and couldn't be more pleased. The rifles I zeroed were .223 Rem and .17 WSM, both of which have "reach out" scopes. At a 100 yards with 18x, I didn't have any trouble with "traditional" targets, but I know that with the less magnified scopes I have on my rimfire rifles, these are going to work great, because the crosshairs will be easier to hold on the white bullseye. The orange "diamonds" seem to draw the eye to the center, where the scope reticule is easy to see. I'll be ordering a LOT more of these targets! These are the best targets that I have found for zeroing a scope. The layout is very friendly to the eye as far as crosshair alignment. The one inch squares radiating from the center point, simplify making your scope adjustments. Have used this target and the one before it for years. Have shot sub quarter inch groups with these. Great to beyond 200 meters. The old version was better at longer range. The design of these targets was very well planned out. No guessing if the cross hairs are in the center of the target. Graduations help for quick assessment and need for any changes in scope. These targets are great for sighting in your rifle. I think they are easy to see and you can easily use all 5 targets to save breaking out another one. I had to order these direct, because the store that stocked them local went out of business. These a so easy to see and sight on. I've used these for many years and have tried others but come back to these. I certainly wouldn't mind if they would make these on a splash target for 200yd smaller caliber rifles. Sometimes a bit hard to see at 200yd with a .223 or .17 hole. For sighting in a scope this is the best I've found. You put the cross hairs over the cross hairs on the target, pull the trigger, and you cannot get more accurate than that. Helps me get 1/4" grouping at 100 yards with an AR.